French: Cabézon tacheté; German: Tupfenbartvogel; Spanish: Chaboclo Turero. 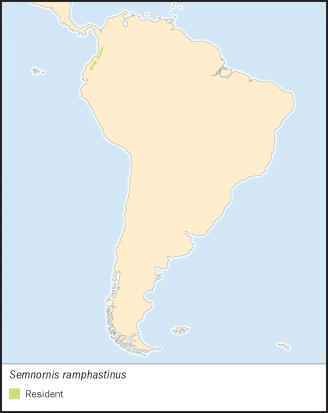 West Colombia to Venezuela, the Guianas, Ecuador, Peru, Bolivia, and east through Brazil north of the Amazon, but restricted to a small area south of that river. 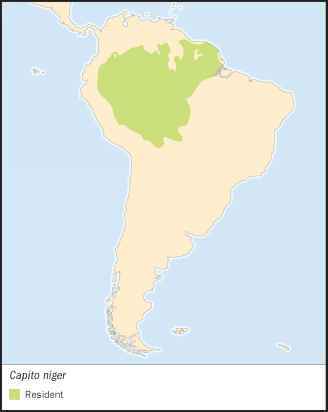 Mostly in mature, lowland forest, both dry and wet floodplain forests; also upland forest, forest edge, gardens, orchards, plantations, and elfin mossy forest at high altitudes in Peru; forest patches in savanna and coastal forest in the Guianas. 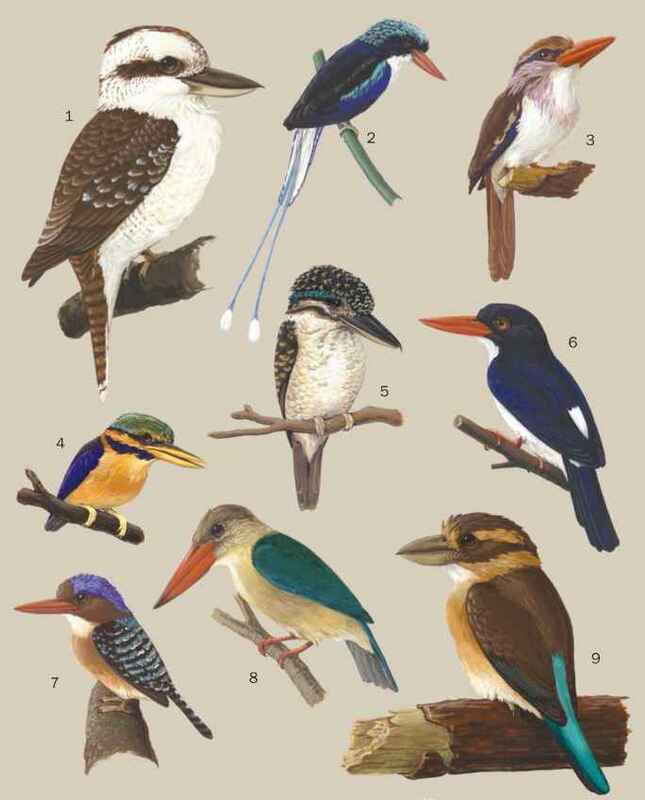 Usually solitary or in pairs, foraging through canopy, sometimes descending to lower levels of forest; also joins roving bands of various flycatchers, woodcreepers, manakins, and tan-agers. Typically acrobatic when feeding, searching leaf clusters, lichen, and old bark, often at tips of tiny branches and twigs. Eats insects and fruit of many kinds; picks clusters of leaves to shreds and breaks into bunches of dead leaves to find insects, but 80% of food is fruit and oily seeds. Sometimes holds large fruit and tough insects with its feet and pecks them into pieces. without a break, sometimes fading away or continued at a lower volume. Otherwise, courtship, display, and breeding cycle are little known. Both sexes excavate a cavity in a tree stump and 3-4 white eggs are laid; incubation by both parents, period unknown. Chicks fly when 34 days old and fed by parents for an additional 23 days or so. Not threatened; generally common throughout its large range.